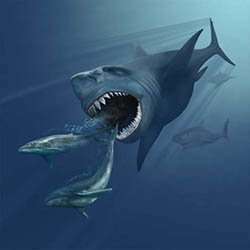 Muons showering Earth may have spelled curtains for Megalodon, a school-bus-sized shark, 2.6 million years ago. Credit: Wikimedia Commons. "I've been doing research like this for about 15 years, and always in the past it's been based on what we know generally about the universe—that these supernovae should have affected Earth at some time or another," said lead author Adrian Melott, professor emeritus of physics & astronomy at the University of Kansas. "This time, it's different. We have evidence of nearby events at a specific time. We know about how far away they were, so we can actually compute how that would have affected the Earth and compare it to what we know about what happened at that time—it's much more specific." Whether or not there was one supernova or a series of them, the supernova energy that spread layers of iron-60 all over the world also caused penetrating particles called muons to shower Earth, causing cancers and mutations—especially to larger animals. "The best description of a muon would be a very heavy electron—but a muon is a couple hundred times more massive than an electron," Melott said. "They're very penetrating. Even normally, there are lots of them passing through us. Nearly all of them pass through harmlessly, yet about one-fifth of our radiation dose comes by muons. But when this wave of cosmic rays hits, multiply those muons by a few hundred. Only a small faction of them will interact in any way, but when the number is so large and their energy so high, you get increased mutations and cancer—these would be the main biological effects. We estimated the cancer rate would go up about 50 percent for something the size of a human—and the bigger you are, the worse it is. For an elephant or a whale, the radiation dose goes way up." "One of the extinctions that happened 2.6 million years ago was Megalodon," Melott said. "Imagine the Great White Shark in 'Jaws,' which was enormous—and that's Megalodon, but it was about the size of a school bus. They just disappeared about that time. So, we can speculate it might have something to do with the muons. Basically, the bigger the creature is the bigger the increase in radiation would have been." "There really hasn't been any good explanation for the marine megafaunal extinction," Melott said. "This could be one. It's this paradigm change—we know something happened and when it happened, so for the first time we can really dig in and look for things in a definite way. We now can get really definite about what the effects of radiation would be in a way that wasn't possible before."